Building custom motorcycles often involves a radical career change, and we’ve seen some pretty strange jumps over the years. Tom Simpson’s background is especially unusual: he trained as a blacksmith before setting up Foundry Motorcycle in England six years ago. 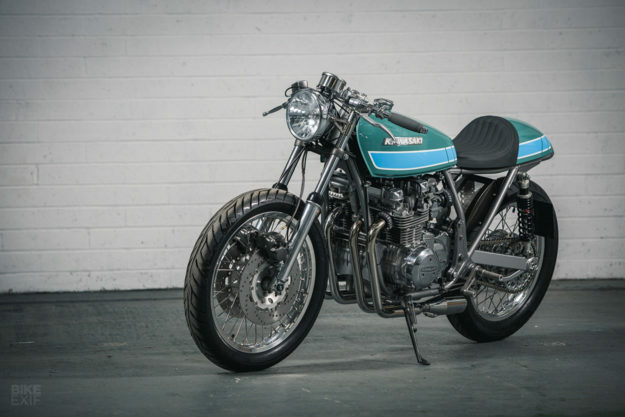 Tom now builds very stylish cafe racers and bobbers in his Chichester, West Sussex workshop. 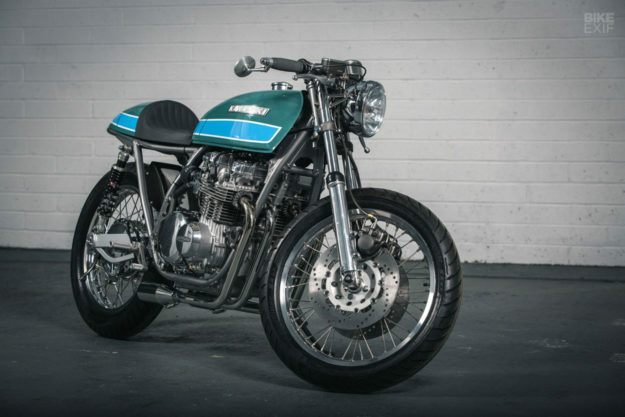 As you can imagine, he has a deft hand when it comes to fabrication—but this Kawasaki Z650 is more about smart mechanical modifications than English wheels and ball peen hammers. “Originally there were two of us at Foundry, but my partner left when we discovered how hard it is to make a living in this industry!” says Tom. 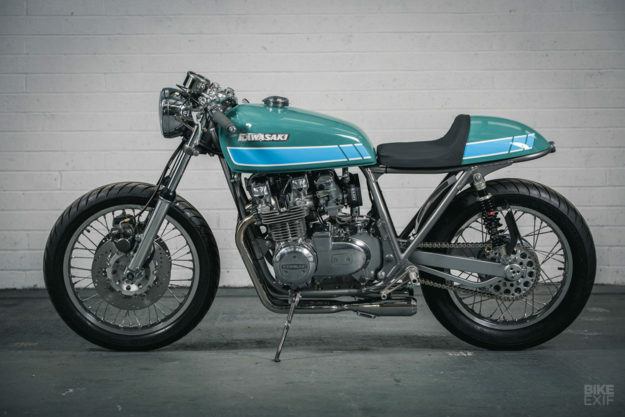 This Z650 would be a dream machine for many classic bike fans, ourselves included. The inline four was the archetypal ‘Universal Japanese Motorcycle,’ and in many ways was a much better sorted bike than the Z1. 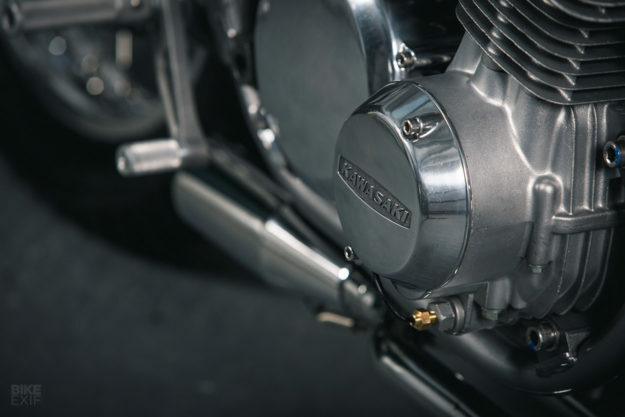 Designed by Ben ‘Mr Z1’ Inamura, the Z650/KZ650 had double overhead cams and pumped out a claimed 64 hp from its 652cc motor—but handled much better. 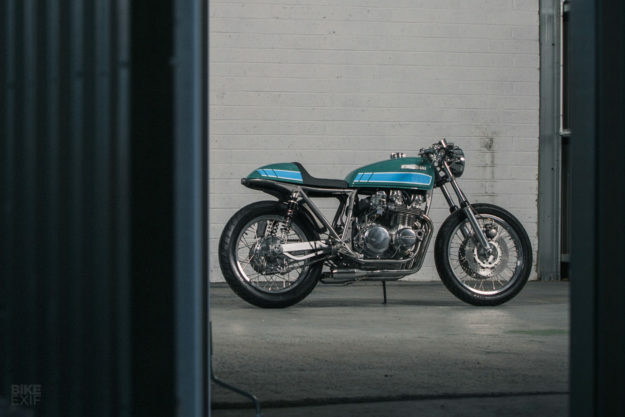 Before Gary handed the Z650 over, he’d had the engine rebuilt. But Tom and his apprentice Alex stripped it down again, taking it out to a 725cc with a bore kit—and putting all the other components back to factory spec. The first job was to make the most of the uprated engine. So Foundry rebuilt and rejetted the four Mikuni carbs, wired in a Dynatek ignition and coils, and installed a custom crankcase breather. 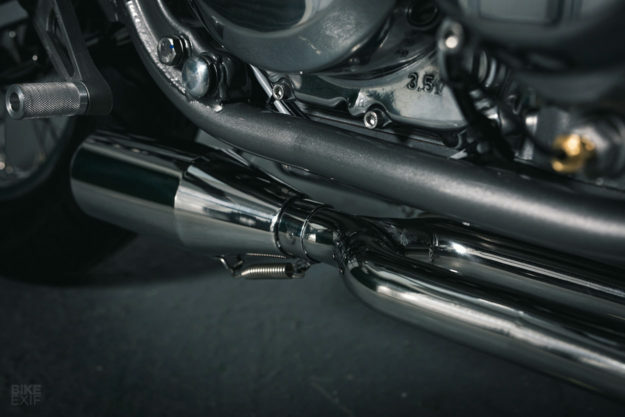 They’ve also built a stubby custom exhaust system out of stainless steel, with two sets of 2-into-1 pipes. The brakes have been upgraded to match, with new EBC drilled discs, braided hoses from HEL, and a Honda CBR RR master cylinder. A Koso speedo sits in a custom stainless housing, just ahead of the modified and polished top yoke. 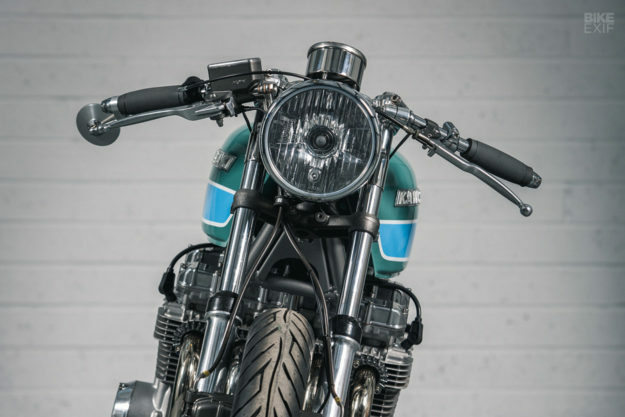 There’s a new 7” headlight in the classic bucket style, mounted on custom brackets, and the switchgear is from Motone. 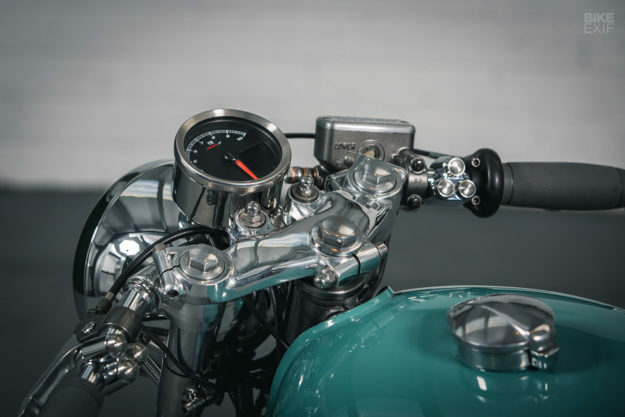 Kellermann supplied the bar-end blinkers, which sit at the extremities of the Tarozzi adjustable race clip-ons. The hidden under-seat electrics are hooked up to a Motogadget m.unit, plus a keyless m.lock ignition system. 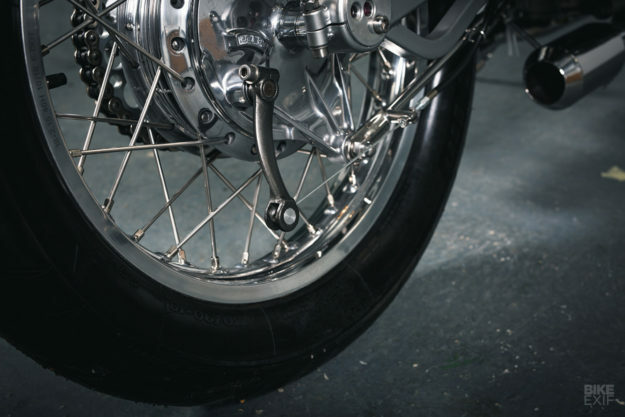 The gorgeous wheels use Morad rims laced up to new stainless spokes. They’re wrapped in Avon’s classic Roadrider rubber, and there’s a Talon sprocket at the end of the driveline. The frame has been detabbed and the back end hooped—with an integrated taillight. It’s supported by new YSS shocks with a very stylish early JMC box section swingarm completing the linkage. Client Gary supplied the seat unit, which Foundry had retrimmed by Trim Deluxe. 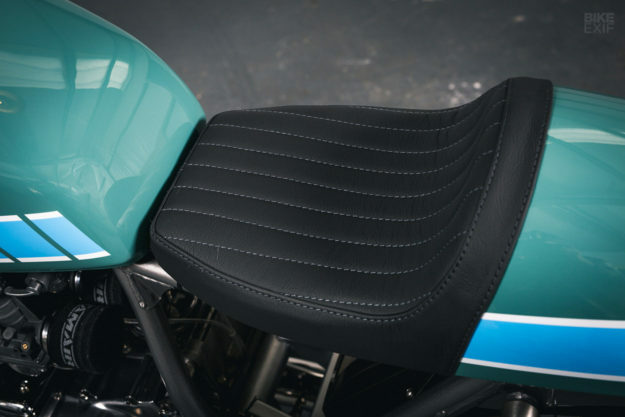 The fuel tank is original, modified slightly to use a Monza-style fuel filler, and the stunning green and blue paint was supplied by local specialist S Jago Designs. It’s almost as shiny as the raw metalwork, which has been buffed to a fine sheen by AM Metal Polishing. 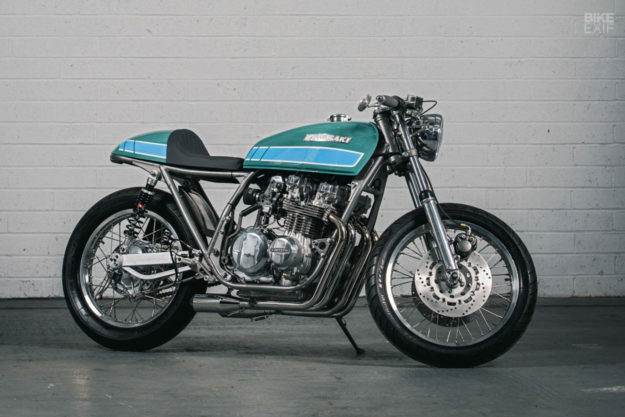 Of course: as Einstein knew, genius is simplicity And in this case, the end result is worth it: it’s one of the sharpest-looking Kawasakis we’ve seen for a long time.